On July 19, 1922, the Mystic River Bridge spanning the Mystic River in Groton opened to the public. The bridge replaced the 1904 bridge and was fabricated by the American Bridge Company. It is a significant example of a Brown Balance Beam Bascule Bridge patented by Thomas E. Brown. The Brown bascule (or drawbridge) was an improved concept in movable bridge technology and the Mystic design provided for two, 230-ton concrete counterweights attached to overhead trusses or balance beams that allowed the 85-foot span to be raised and lowered. 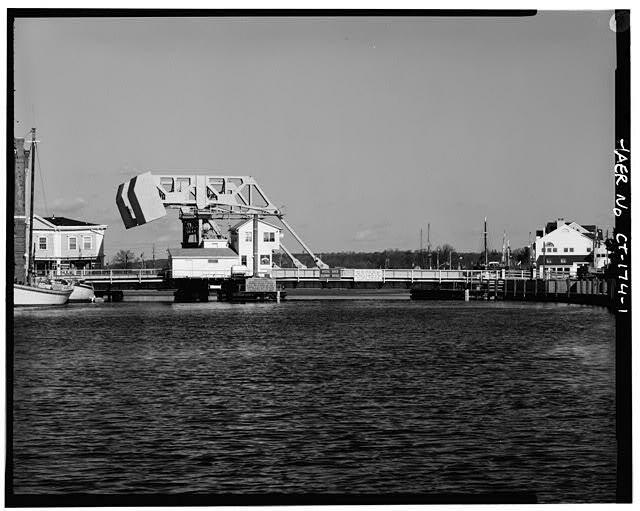 The bascule bridge replaced the swing bridge and provided for a single wide channel rather than two narrower channels with the ability to open the bridge only partially for smaller watercraft.